It seems like a good year for 7 spot ladybirds. There are many more these days than Harlequins around here. Some ladybirds I see are parasitized. I dug on the web today after taking a few photos of one and noticing the ladybird was actually alive, moving its head and palps, but unable to walk. The indication that it was parasitized was the presence of a silk cocoon underneath it to which it seemed to be tethered. The parasite is a tiny braconid wasp, Dinocampus coccinellae apparently a parthenogenetic species. Shortly after emergence, the wasp lays eggs inside larvae, pupae and adult ladybirds. The larvae hatching from this egg starts by eating the reproductive organs and eggs inside the ladybird, causing little external damage, then it develops a trophic organ that absorbs nutrients from the ladybird. The cycle becomes even more gruesome from now on. When the larvae is ready to pupate it severs the ladybird's leg nerves, by which it becomes paralyzed partially paralises the ladybird through some chemicals. 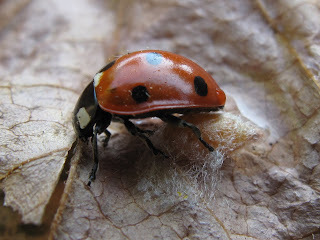 The larvae then emerges from the ladybird through a hole she bores and spins a cocoon between the ladybird's body and the substrate (leaf, twig, etc). The ladybird is alive but paralysed and the parasite pupae enjoys the protection of the ladybird aposematic colors until its emergence a week or so later through the pointy end of the cocoon. Although some ladybirds recover from the parasitism, most presumably die, and it is not known if the survivors will be able to feed and reproduce after this ordeal! More info and photos here. To be continued here. That is indeed a gruesome tale - not sure I should have read that at this late hour! I realize this is an older post, but I am reading some current articles on D. coccinellae and I don't believe the larvae sever the leg nerves of the lady beetle. They apparently secrete venoms which are responsible for the paralyzation and behavioural modification. Also about 25% of the lady beetles do survive, and I believe the paralysis wears off. Thank you for commenting mace, I will update the post with the recent information as soon as I get the chance to read the paper. It is truly unbelievable they can survive the ordeal.